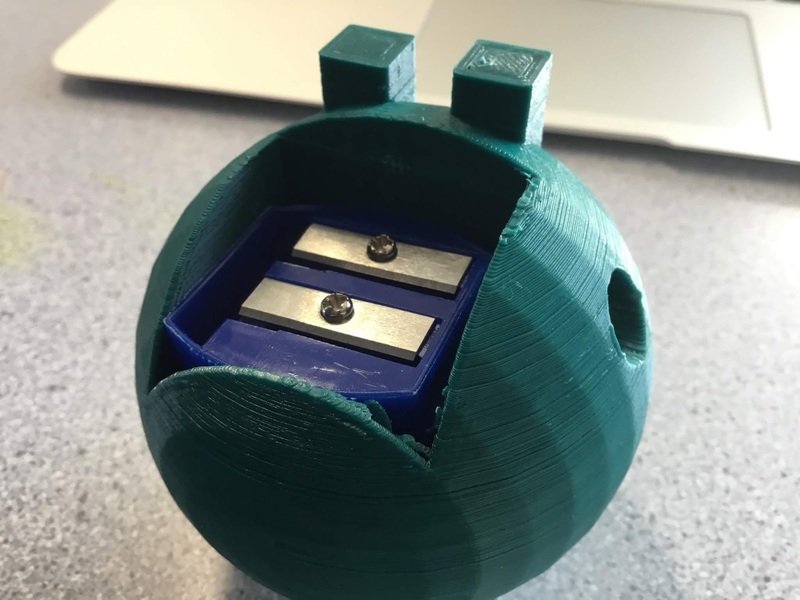 Challenge: To incorporate a pencil sharpener into a 3D Printed design. Above: Design showing location of pencil sharpener. that the students had minimal rafting on the design with the supportive PLA being restricted to the amount that was underneath the base of the tractor. The students are going to review the print when it is completed and look to add additional details to the tractor. These are going to be printed in relation to the size of the tractor that has been produced (see below). Level of Difficulty: High - this design needs to work on two levels, the first aspect is the tractor design and creation. The second aspect was the location of the pencil sharpener. The students opted to have a inbuilt part of the tractor that was located at the front with an insert on the front right for the waste created by the pencil sharpener. Both thsee aspects needed to work in unison for the print to be successful. The pencil sharpener was a mass produced inexpensive plastic one which allowed the possibility of it being super glued into place or being slightly adapted to fit a specific place with regards to the print. Time frame: Sixteen hours - given the scope and size of the print this is the minimum that would be required to make this print both robust and successful. Size: The print was 140mm long and 130mm high including the wheels. The base of the tractor was 40mm across. The location hollow for the pencil sharpen was essentially a 30mm by 30mm insert into the base of the tractor. What we would do differently: Very little - two students have worked on a design for a considerable amount of time to rework, revise and produce something significant. Above: Design shown from the front. 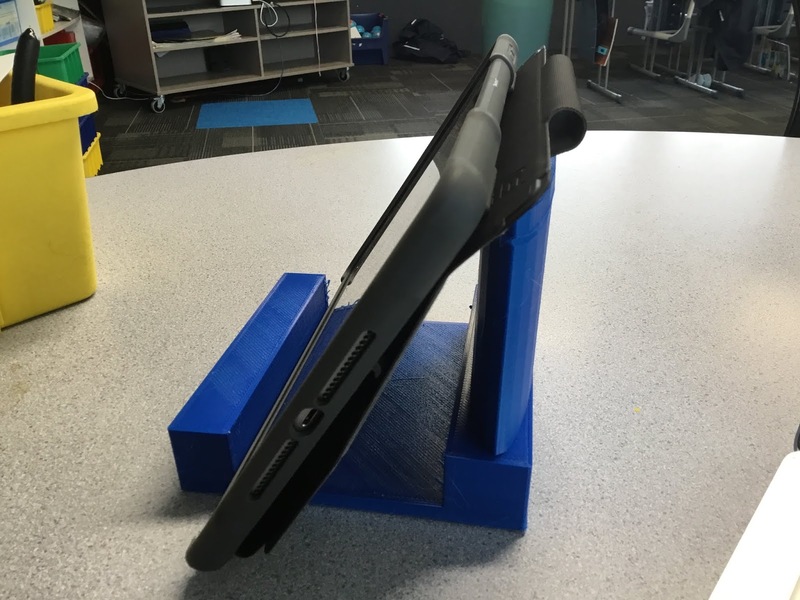 Challenge: Student wanted to create an iPad stand for themselves to use in the classroom. Above: Design shown in use and profile. Level of Difficulty: Medium - this is a straightforward design which is intended to have a very specific purpose reflected in the design size and the printing time. The additional material is intended to be letter and basic shape design in a different colour to stand out and contrast with the dark blue. Time frame: Sixteen hours - given the dimension this is the minimum that was required for this sort of print. Size: The front of the design measures 150mm across. The block that is at front of the design is 30mm by 25mm (and 150mm long). The design had a length of 140mm. The design rises 130mm at the back of the stand to hold the iPad in place. These dimensions are in place to maintain and hold an iPad of any size. What we would do differently: Nothing - this design has worked perfectly from the design process, the teacher requirements of minimum PLA rafting has been met exceptionally well. The next challenge for the student is to design and create the additional printing for the decoration. Challenge: To complete a project that hadn't successfully been completed. Background: This project was an attempt to complete a significant project that hadn't worked in regular printing time. This project was a stationary holder (which have been completed in multiple versions featured on this blog). 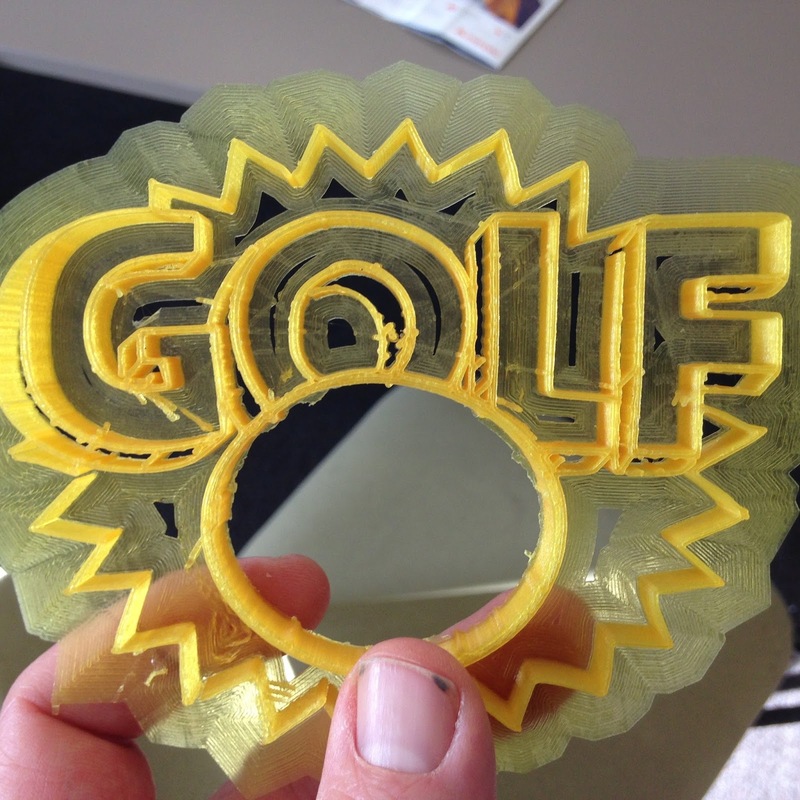 The project was intended to have a 22 hour print time and was left to print over this timeframe. When the machine was checked the following day, instead of having a completed print there was a jam, caused at the back of the machine where the PLA had essentailly cut itself off at the feeder meaning that the printer had jammed leaving the print about three quarters of the way through (as you would have experienced this has left the print incomplete but still contributed a significant part of it. The intention was not to produce something that was incomplete but also not to waste the material that had already been produced by the printer. This jam of the PLA is something that occurs from time to time and has been avoidable. I've seen developed printer dispensers at the back of the machines (Ultimaker 2+) to minimise this but have experiences jams like this once every couple of months (again of running a machnine on a more or less non-stop basis. Level of Difficulty: To complete this print with a second level will be required that will need to replicate the first perfectly - the issue will be the student identifying the point which the print was completed to and then placing a second level successfully on top. Timeframe: This was intended as a twenty two hour print, that made it to the sixteen hour mark and therefore has a further six hours to go. The design functionally works at present however there needs to be an additional level added to the design, which would need to be a minimum of 10mm in length to complete the design. This could take, depending on the design of the student, between an additional one to six hours. Size: The current print project measures 110mm across and is 120mm deep. It is currently 85mm high. The walls of the container are currently 5mm thick and consists of four storage compartments, which range in size from 30mm to 100mm (at the back) and 65mm to 35mm for one at the front. 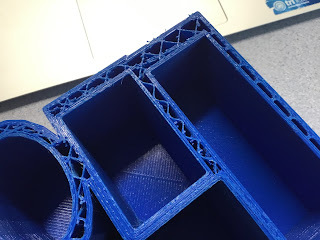 What we would do differently: The problems with this print not completing were related to the machine jamming at the back, not the design of the print the challenge then is using what has been completed to work it into another project. Above: Design shown from above. Challenge: Student identified that the classroom door had a particular habit of closely sharply and wanted to produce a door stop to prevent it closely prematurely. Background: We are always encouraging the students to think about problem solving challenges and ways in which they can remedy issues by using technology and in this case the 3D Printer. 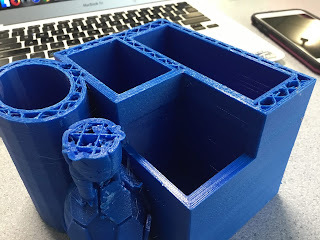 This case involved the door in the classroom, but in a move that was initiated by the student they wanted the name of the classroom created on the print so that it wouldn't be removed or taken by someone else. 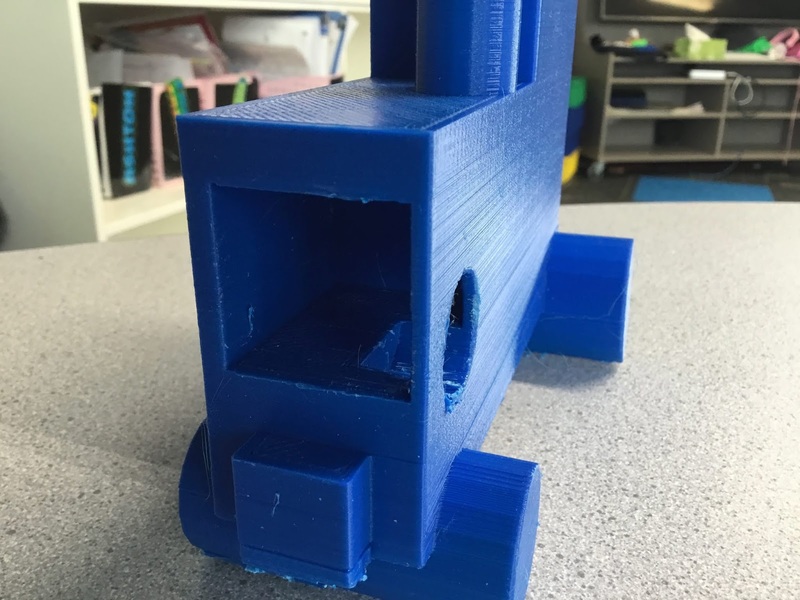 The door while being a standard classroom door is particularly heavy, so the initial design and size of the door stop, which was a one hour print, wasn't able to stop the force of the door. 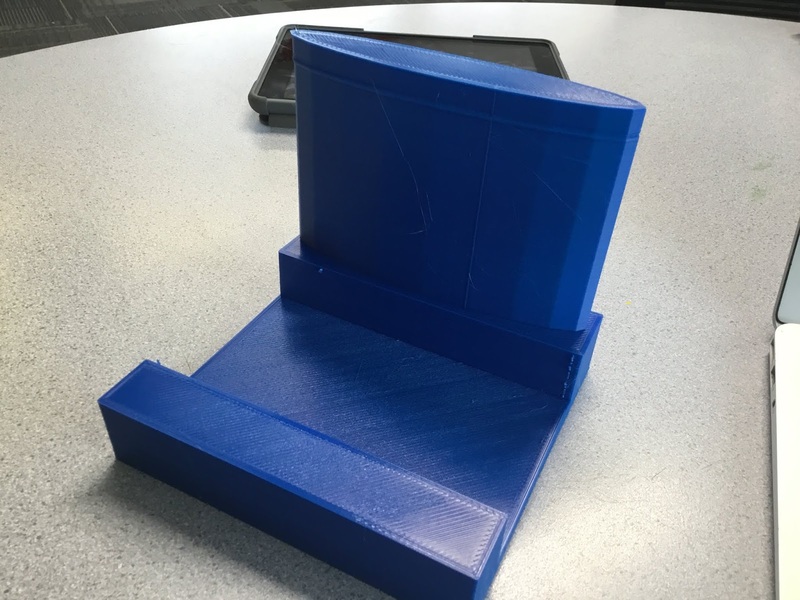 Level of Difficulty: Medium - the student needed to work out the physics of a door stop that would be big enough to stop the weight of the door so a larger print than was originally created was needed to be designed. The two versions were identical, the student concerned had simply enlarged the scale of the design. Timeframe: The first print was one hour, the second three hours and twenty minutes. Recent updates with CURA Ultimakers 2's software have considerably reduced the print time for projects. Size: The second three hour version of this print was 110mm long, 40mm long and 30mm high. What we would do differently: Very little the biggest issue that was presented by door itself and solving the issue with a doorstop is a very positive thing but the issue is the weight of the print. This hasn't been identified by the student yet. Possible remedies that need to be discussed is the rate of infill (which is currently the default of 20%). The other option would be for the doorstop to have a casing or being hollow to allow the inserting of something metal to give it more weight. Challenge: For students to design something original that would use another common object - pencil sharpener. Above: Design shown from other side. theme for the item came as a result of being aware of the shape rather than fans of the game (which came out in 1980!). The challenge for the students was having the two items work together in a practical way and in particular the insert for the pencil relative to the blade for the pencil sharpener. Level of Difficulty: Medium - as always combining two different aspects of a print or a print and an object can be complicated and difficult for the students to sometimes master, as has been the case for this. A further unexpected aspect to this print was the shavings from the pencil when the sharpener is used this needs to be put into the rubbish bin - the students hadn't anticipated the sharpening and where that would come as a result of the pencil sharpener being used. Timeframe: Five hours. 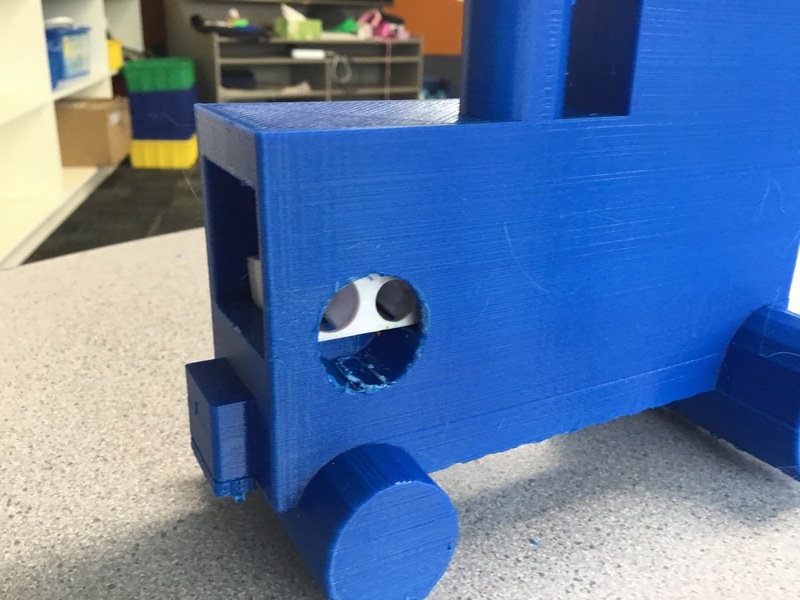 The print is was relative to the size of the project and the pencil sharpener. Size: The design measured 80mm across and was 80mm high. The design was relative to the shape of the pencil sharpener. The students had a free choice with what they choose and opted for a double pencil sharpener. If you look at the photos you can clearly see a single pencil insert. What we would do differently: This challenged the students who attempted it on the basis of having the relationship between the print and the object. The students attempted to complete a complex design to work and are constantly reviewing the project. Challenge: Student wanted to produce a name plate/badge that could be used in an outdoor setting (such as a stable) as an identification for a horse (such as putting a label on a stable door). Background: Students specifically choose 3D Printing as the tool to do this as she wanted something that could potentially get wet (which would exclude Laser Cutting without some form of water proofing). The student involved is a Y6 student (ten years old) but has consistently shown outstanding design and creation - the teacher had no input into this design what-so-ever the finished product was delivered to the teacher and the student asked it to be printed. There is consideration for spray painting to further its presentation. Level of Difficulty - Medium: the student has down time and time again that she is able to adapt designs that are well balanced and creative. In this instance she integrated having the name of the pony/horse combined with the horseshow design. The horseshoe was located from a typical search of Tinkercard and the lettering came from the main interface. Timeframe: One Hour forty minutes - something needs to be adapted with the print as detailed below. 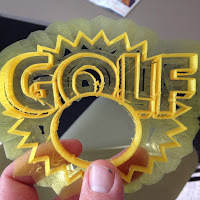 This would extend the timeframe for printing slightly but not significantly. Size: The design is 110mm across and was 90mm high from top to bottom. 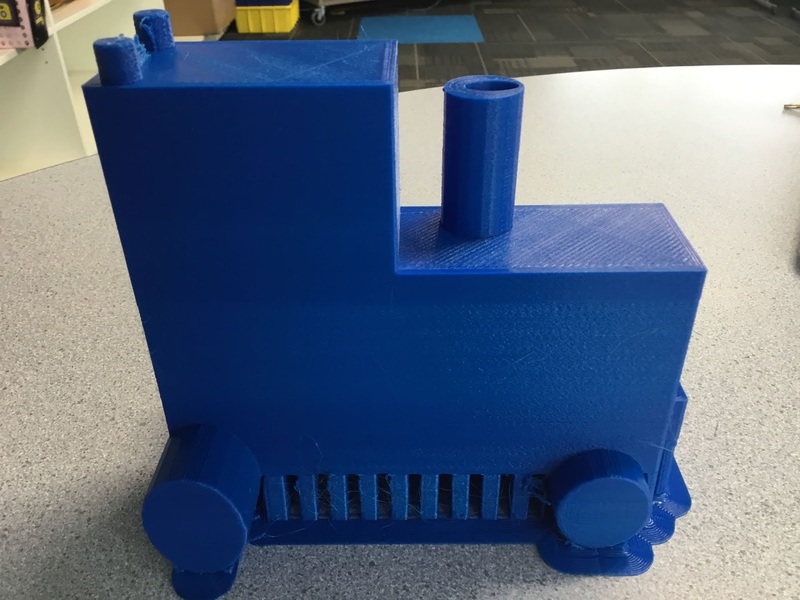 The design was a creation that could be potentially re-sized making it larger as the student deemed it necesarry - which would obviously affect both the size and the print time. What we would do differently: The student needs to consider that if this is placed on a stable door what the colour of the door would be and how it would affect its display. It could be super-glued in place but there are not any drill holes currently on the design (this is being considered relative to the final size of the project. 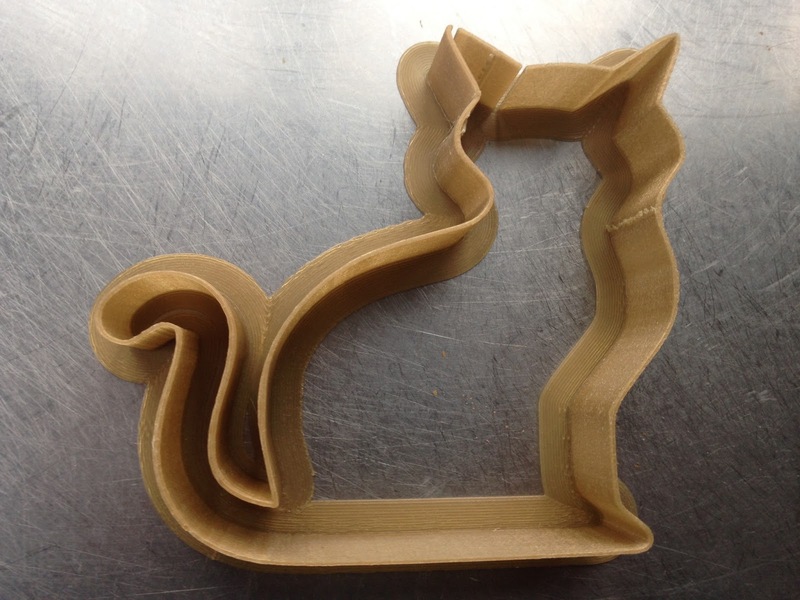 Challenge: For students to produce an original and personalized for a Cookie Cutter. which produced several pages of examples. We were wanting to produce a reading made .stl print to run one off for the students. We located an example on 'Thingverse' of a three piece Triceratops Dinosaur Cookie Cutter - this provided us with the .stl file to run through our printer. Level of Difficulty: Nil - we wanted to provide a pre-made example for our students so were simply looking for an example that we could print that was available to use as the inspiration of our students to produce an original. Time frame: Three and a half hours - it was a design sourced from a third part therefore the dimensions of the design, print time etc were already pre determined and we had no input into that, it was simply to provide an example. Size: Its slightly larger than it might appear the two main body pieces are 150mm across and 75mm high. Again as we've stated this came as a finished product that we simply ran off without design on our students part, the purpose being to provide an example to act as inspiration. What we would do differently: Occasionally examples that are already created are shown to our students as an example as something to build or work on and then deconstruct it from there. This is providing a hands on example for a group of students who need hands on example to inspire them. The Cookie Cutter works well as we are producing an outline so the print time is not too extended for the students to produce something and it has a use as a tool.